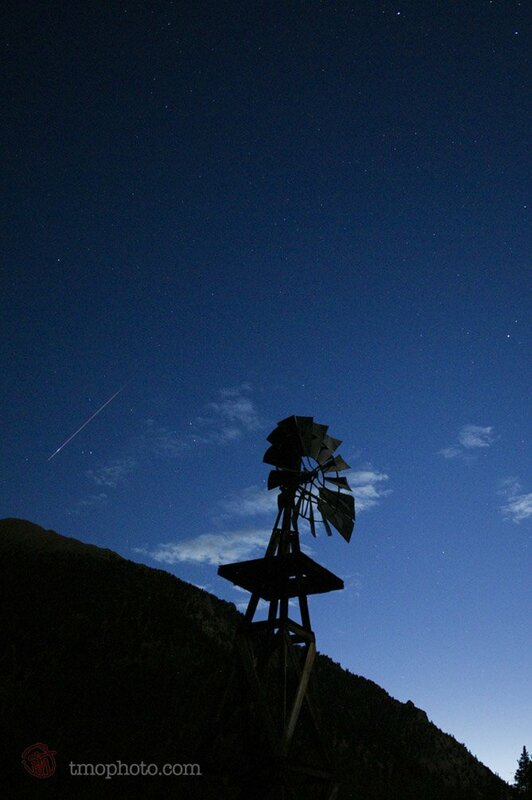 I was shooting timelapses of the sky trying to capture the meteor shower between Twin Lakes and aspen colorado. Photo details: Canon 1Ds, 24mm, f/2.8, ISO 1000 6 second exposure captured at 5:31:44am (2 meteors) 5:29:44am (one small one) and 5:35:52am (one big meteor). I unfortunately had fallen asleep before the clouds cleared out and never saw one myself. 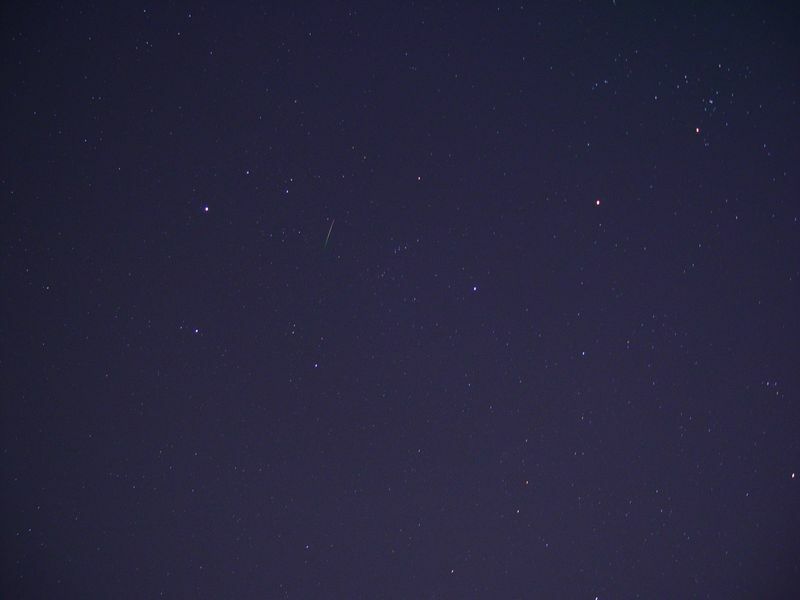 I took about 1300 frames total and have pulled 3 out so far with meteors. Click here to view the time lapse movie. 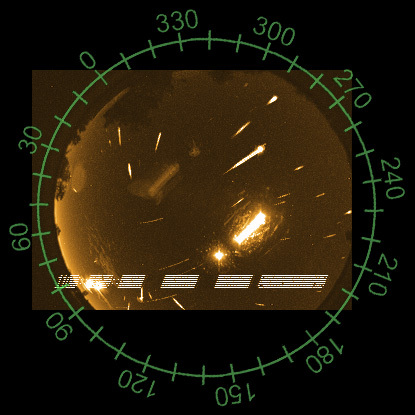 This is a composite image of 49 Aurigid meteors collected with a video all-sky camera. 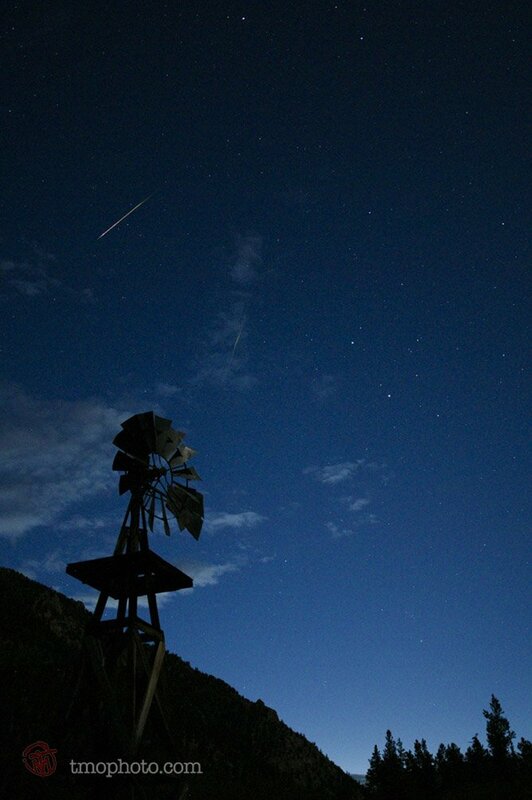 Nearly all the meteors occurred during a sharp peak around the predicted time of UT 11:30. 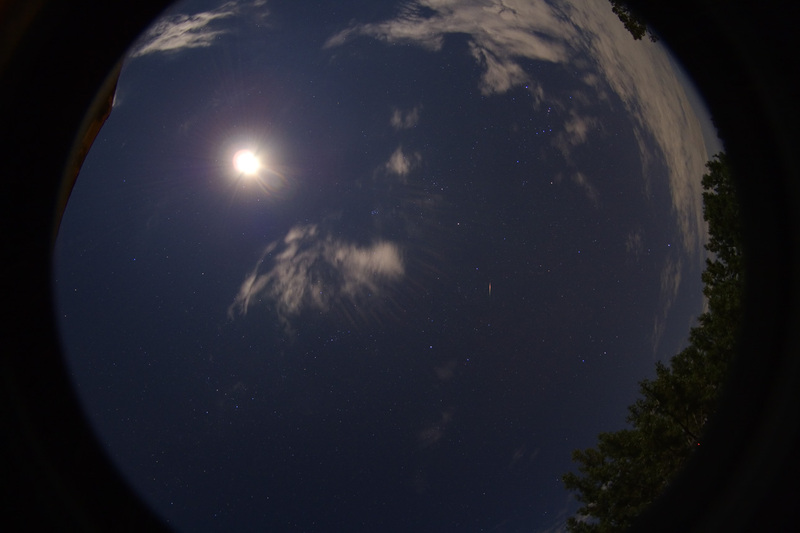 First tests with our new Sigma 8mm fisheye wide open showed pinpoint stars and we even got several meteors. The rate here in Payson was about 24/hr zenithal rate. With moonlight washing out much of the desert sky, I was able to see only a few Aurigids during the morning hours. Photo details: Canon 20D, 14mm f/2.8L lens at f/2.8, 1600 ISO, 5s exposure. I went out to my front yard from 4:50 to 5:50 AM MDT. I didn't have high expectations, so I was pleasantly surprised. I saw about 16 meteors, 3 of them fairly bright, and one of those three I was lucky enough to catch in an image (attached). I may have caught a couple faint ones as well, will have to check carefully for those and for the two satellites I should have imaged. I saw many bright ones but never had the camera pointed in the right direction. I got up at 4:00 AM and looked out the window and they were falling at the rate of several a minute. I set up my camera about 4:15 but they had already slowed down to less than one a minute. I observed for 45 minutes and saw 20 meteors. 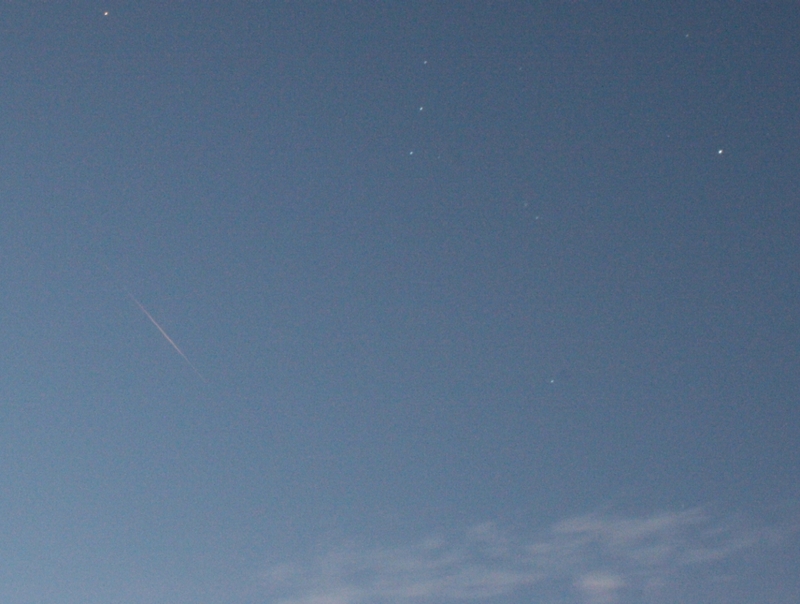 Around 5:20 MDT I saw a burst of three meteors. Photo details: Nikon D70s, 1600 ASA, 10s exposure. This is a quick report on the Aurigids from astronomy instructor Richard Nolthenius. Several members of the Cabrillo College Astronomy Club watched from the Santa Cruz Mountains. I did 10 minute counts from 10:40UT to 12:10 UT. Rates started around 10/hr and rose to almost 100/hr at 11:15UT, dropped slightly to 11:35UT, and then dropped sharply back down to 10/hr after 11:40UT. 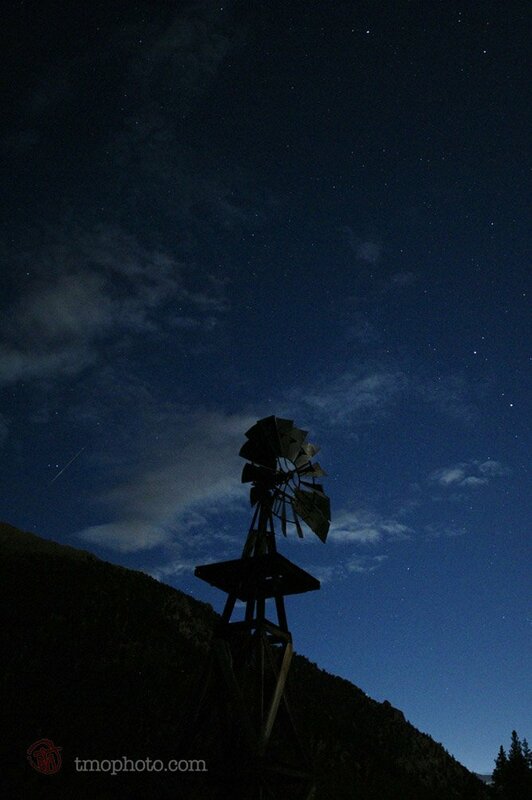 Up to the peak, the meteors were almost all bright; magnitude 1 and brighter. After the peak, they were dimmer and sparse, almost like someone just shut off the meteor spigot! A couple of members got photos, which I hope to post on our website later. Chris Kitting has just sent me the first image, which I include here. One of the last pix I took before it got too light. Saw only 2 meteors total. from Paul Robinson of Boulder, Colorado: "This morning (Sept. 1, 2007) I saw a nice display of Aurigid meteors from just east of Boulder, CO. I watched from 4:45 am MDT til 5:45 am MDT. The first meteor I saw was at 4:55. The rate climed unsteadily to a sharp peak at 5:20-21 during which I saw 3 or 4 meteors/minute. Then rates fell sharply. 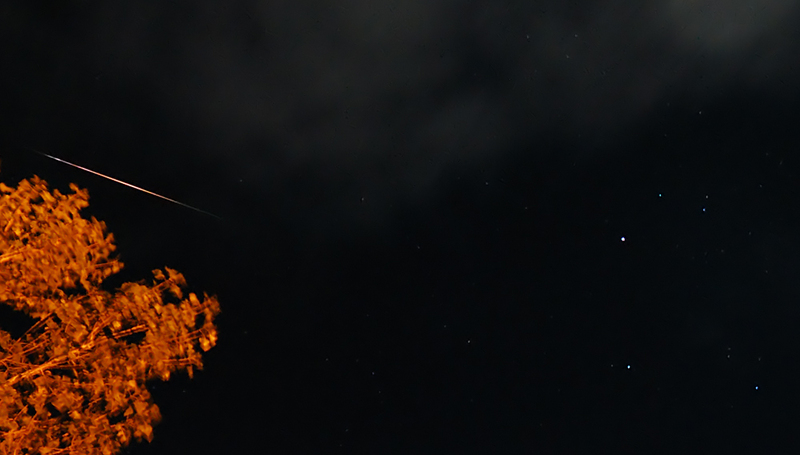 The meteors were fast and brief lasting about 1/2 second with brief trains. Most were magnitude 2 to 0, though one was -2. It was alot of fun considering the mystery of whether there would even be a shower and how good it got to be!" 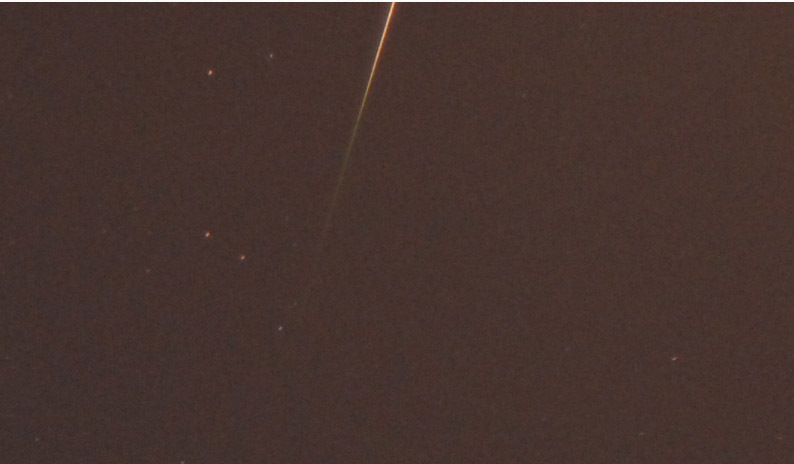 from Michael Funk of Astoria, Oregon: "I estimate about 20 meteors per hour is what I observed last nite from 4;00-5:00 am. 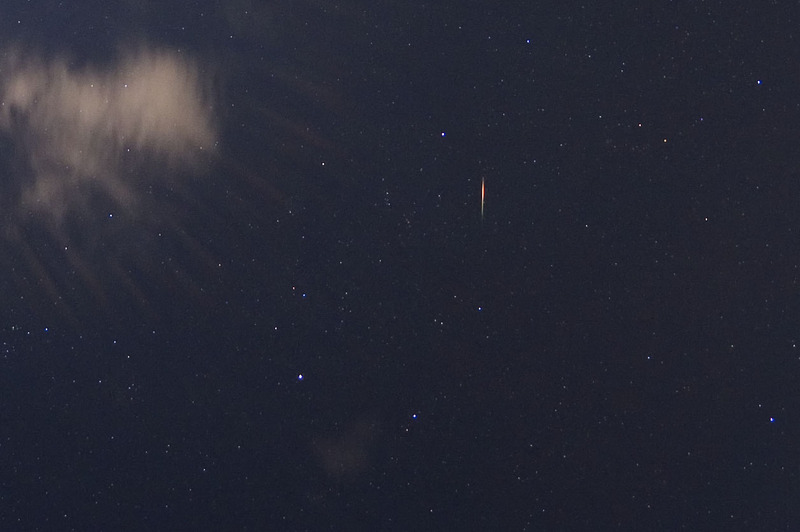 One particularly bright one seemed to skip on the atmosphere as it flashed bright a couple times." 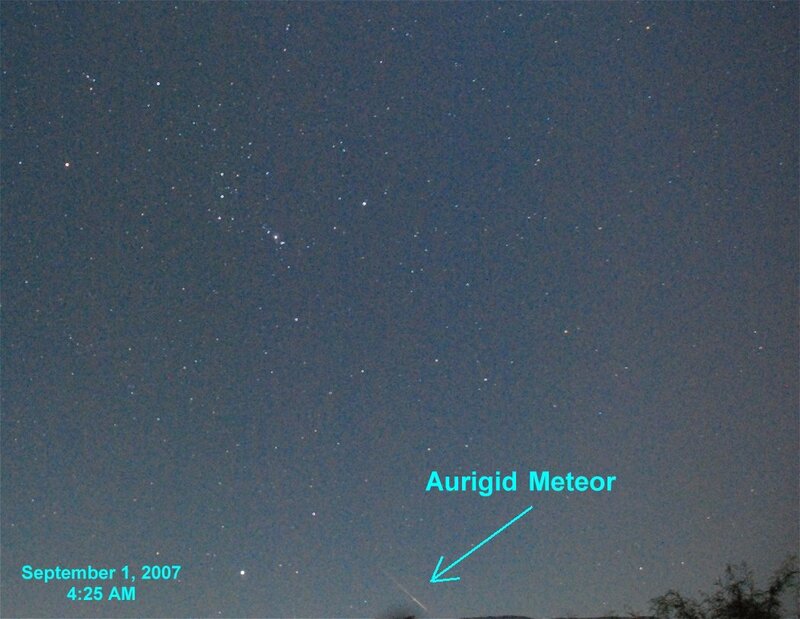 from M. L. (Chip) Gentry of the University of Texas at Austin: "I spotted four Aurigids between 6:25am and 6:44am CDT. The brightest was about Venus brightness, dimmest was slightly dimmer than Rigel. Two came with seconds of each other, around 6:34am. Movement was very fast. 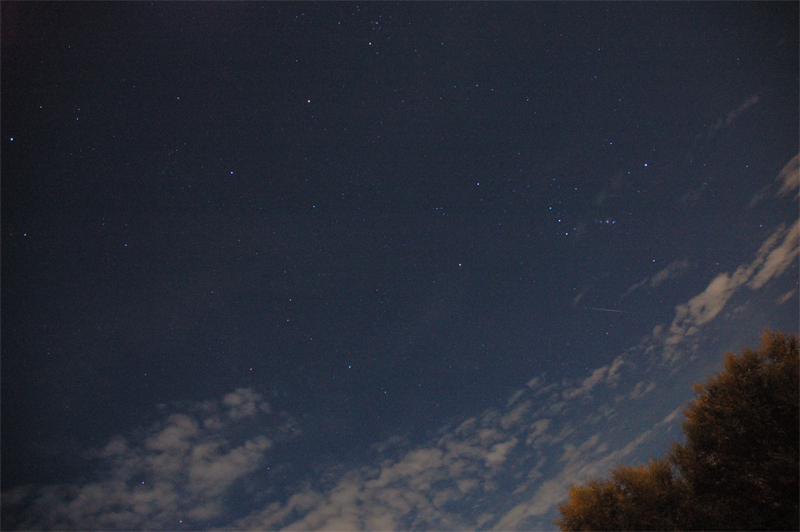 I had maybe a 40 x 40 degree patch of sky in the Orion direction to work with due to cloud cover." from Janice of Boise, ID: "I watched here in Boise, ID from 5-6 AM. Saw 3 slightly green, and two yellow-orange. There was one white one almost due north that left a trail that was visible for many seconds. I was not disappointed. Total count 20-25, some were just small dots that did not leave a trail." 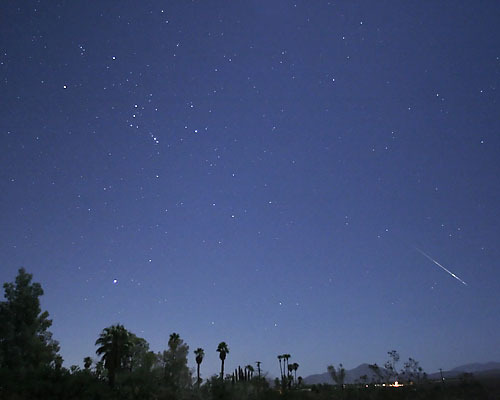 from Tom Klimek of Lemon Grove, California: "From 0415 to 0435 Pacific time, I saw eight meteors. Two were especially long and bright, about the same magnitude as Sirius. 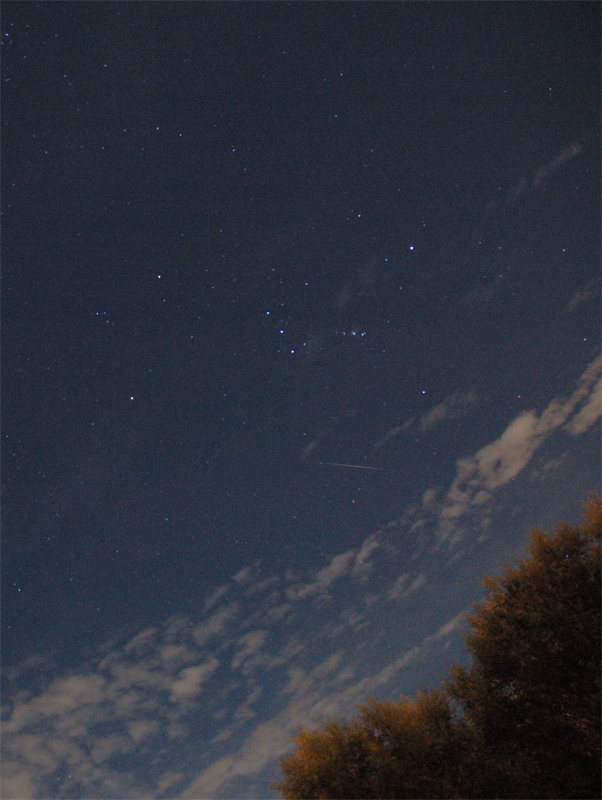 One left a five second trail across Orion!"